I know in some circles I’m the last train to leave this station, but I recently ran into the blog Orangette. Fabulous photos, the perfect tone with the writing. (Which is why it’s super well-known, and she’s written an even more awesome book that I read half of last night, and why I’m kind of beating a dead horse here.) But to the point… I ran into a recipe for overnight yeasted waffles. A couple posts back I wasn’t necessarily blown away by the cheese I made… it was as it should be, at least, but nothing beyond that. Not so with these waffles. They were unlike anything I’ve ever had; in a normal waffle maker (not a Belgian one) they crisp up and almost entirely and dissolve in your mouth. And the kids cleaned their plates at breakfast, which has not been a pattern of late. They may not be for everyone – Alicia prefers a cakier waffle and thought these were more like a croissant than a waffle, but said they were good (in that way that meant “good for you to make for you and the kids when I am not at home”). And I am thinking that they would be good with sourdough starter instead of regular yeast (Zack, can I have some more? I killed the last batch.) But seriously, try these, you won’t regret it. 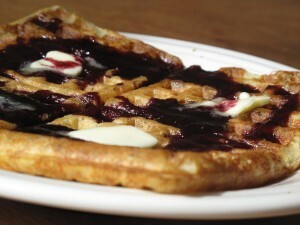 Marion Cunningham's Raised Waffles via Orangette with blueberry syrup from last summer. All it takes is a self-addressed stamped envelope to get some starter. 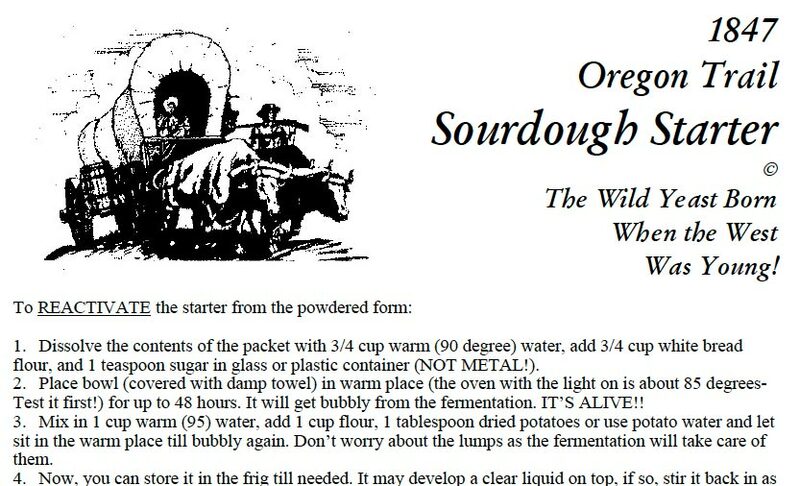 Came across this free sourdough starter offer… I think it’s actually from the Oregon Trail and 150 years old. I’m mailing off for it today; look for an update in a month or so. Sounds like a fun thing to try with our bread technique. Read the “About Carl” section… what a champ!